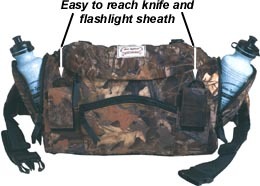 Here is your new fanny pack (beltpack) for the 2001 hunting season, the Predator Beltpack from Crooked Horn Outfitters. Known for high-quality hunting equipment made in the USA, Lennis Janzen and his wife Danell have this year again released some great new products for hunters. This week we are highlighting the Predator Beltpack which was created for the hunter who wants to travel light.  Hip belts are provided for attaching accessories: ammo, rangefinder, etc. The Predator Beltpack is made of Saddle-Cloth material, laminated to weatherproof nylon pack cloth. This combination makes for a pack that is waterproof, durable, burr-free and quiet. If you are a California hunter, you sure will like the burr-free feature for those late summer and early fall hunts in California's foothills. For more information, visit Crooked Horn Outfitters' web site at www.crookedhorn.com.